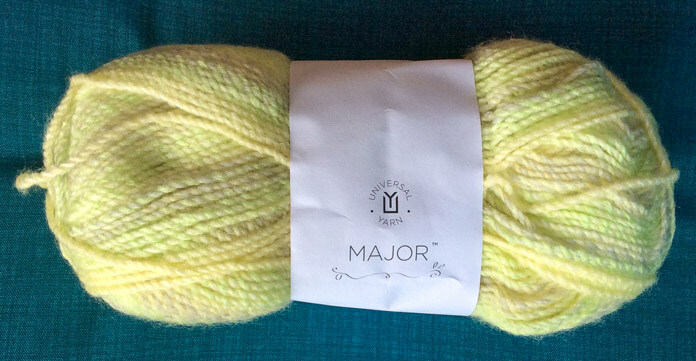 Welcome back to our week with Major, a bulky, acrylic yarn. On Monday, we looked at the construction of this core-spun, variegated, marled yarn. Yesterday we extolled the values of a 100% acrylic yarn. While I was writing, a pattern for a baby blanket popped into my head. Before jumping into that, I want to talk a bit about working with variegated yarns. Along the way, I’ll provide some cool tips to make seaming go smoothly. You can have a LOT of fun with variegated yarn. 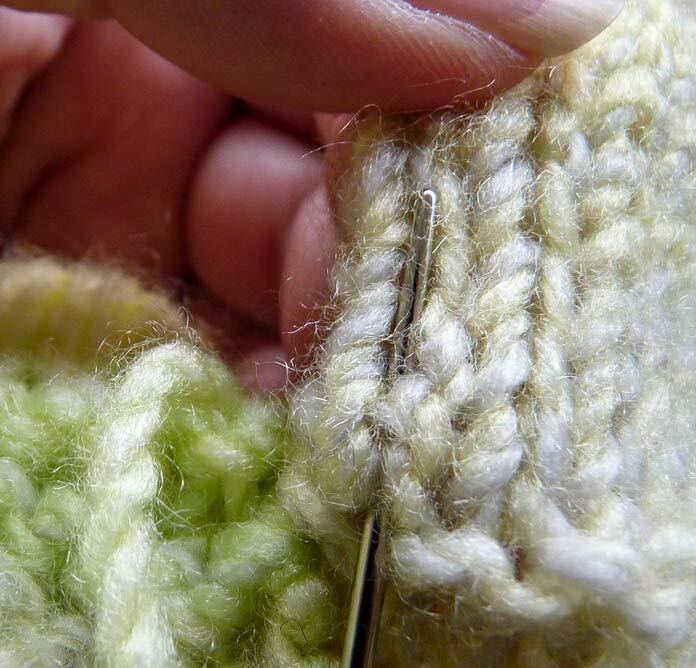 The number of stitches you have on the needle will change the depth of the stripes as you knit. I’ve seen sweaters worked so that ⅓ of the front and back are made from ⅓ of the stitches, and a separate, wider panel is made with the remaining stitches. My baby blanket is based on this theory. In my experience, yarns that have variegation in them, like Major, work well when the pattern pieces don’t have a lot of shaping – sweaters with drop shoulders, blankets, scarves, and hats all fit this category nicely. 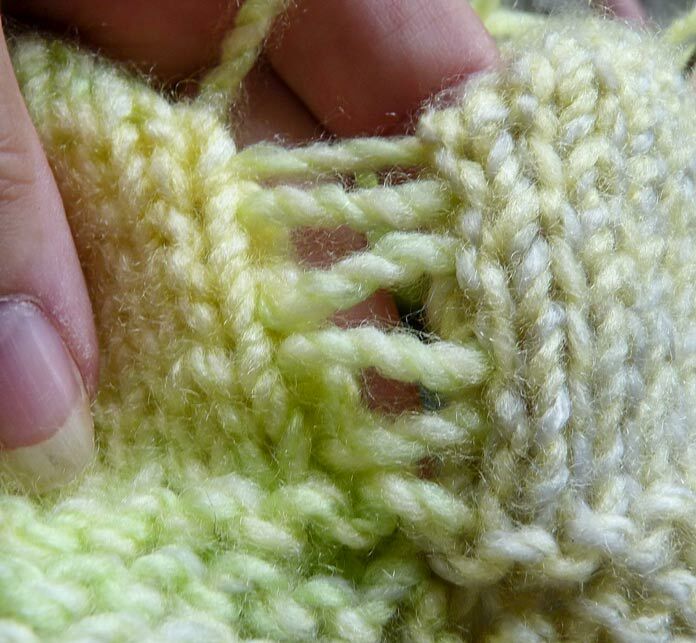 When adding sleeves to a sweater, or when making mittens, you might want to try and start the two pieces at the same point in the color repeat – or not – it’s completely up to you. 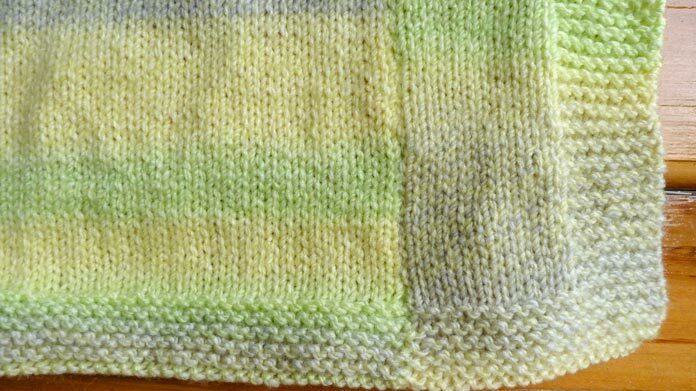 Yesterday I fell in love with the Honeydew colorway for a baby blanket. Using our different width idea, I created this pattern for a baby blanket made with wide and narrow stripes, that are then sewn together using one of my favorite seam treatments – mattress stitch. Let’s go! Fun with stripes! The right panel of this baby blanket has 20 stitches, and the center panel has 60 stitches. A good size for an all-purpose baby blanket is 30” x 40” [90 x 100cm] I’ve sized our blanket to be smaller – about 28″ x 30″ [70 x 90cm] which is a good size for a car seat or stroller. Add a third ball to make a full-length blanket. Note: The blanket is made in 3 panels, which are stitched together to show off the striping of the yarn. Cast on 26 sts. K 10 rows. Row 2: P to last 8 sts, k8. Rep these 2 rows until the panel measures 28” [70cm] ending with a WS row. K 10 rows. Cast off all sts. Time for a couple of bonus tips – when working this panel, it can be difficult to differentiate the side border. 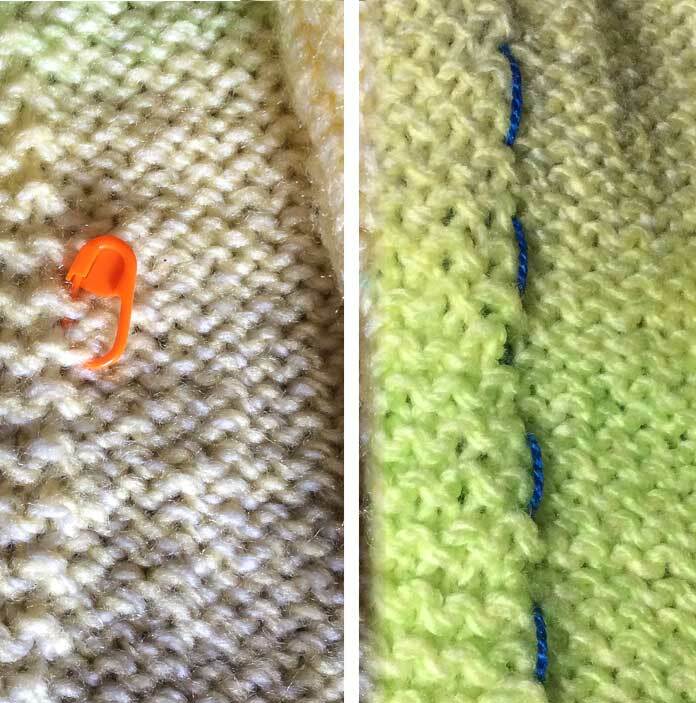 To make it easier to see these stitches, you can use a stitch marker on the wrong side to remind you that you’ve come to the last 8 stitches. Another use for the stitch markers is to place one a couple stitches in from the edge that will be seamed every 10 or 20 rows. This will help to ensure that the seams sew up evenly, without stretching or bunching one side or the other. Another way to keep track of the 8 border stitches, is to weave a strand of contrasting color yarn between the 8th and 9th stitch. 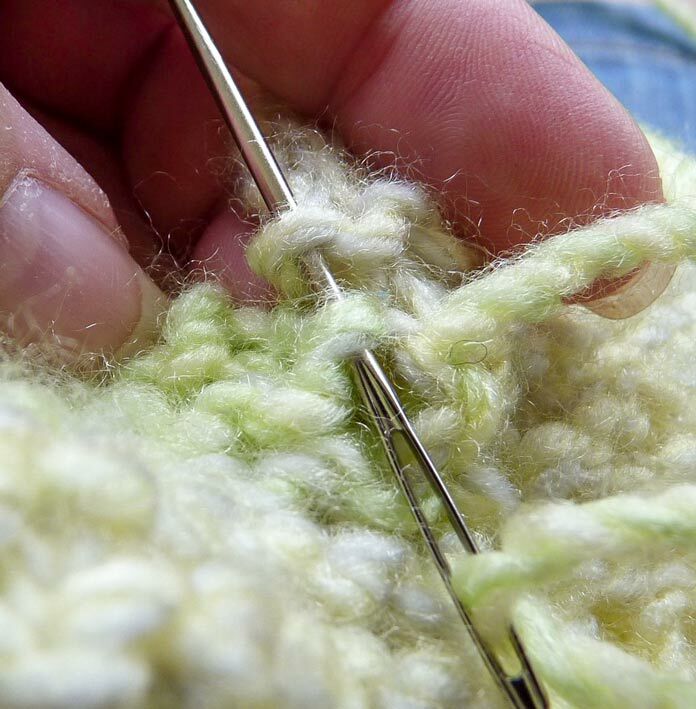 Use a stitch marker or a strand of contrasting yarn to indicate the division between the body stitches and the border stitches. Another issue that may arise is a simple fact of physics – the garter stitch border will be shorter than the stockinette stitch. That’s why we choose garter stitch – to create borders that will hold their shape, but garter stitch compresses vertically in comparison to stockinette stitch, so they can pull in too much. That’s when I like to “build them up” by placing a short row every 2″ – 3″ [5 – 7.5cm]. There are lots of ways to do short rows, but when it comes to a baby blanket, I just knit 8 stitches, turn, knit back to the edge, then work the next row. No fancy wraps required – the baby isn’t ever going to notice! Cast on 60 stitches and k 10 rows. If you want to continue with my stitch marker tip, remember to place markers a few stitches inside the side edges, at the same intervals as on the Right side panel. Cast on 20 sts and k 10 rows. Row 2: K8, p to end. Again, use the stitch markers, and remember on this panel to do short rows, if you did them on the Right side panel. Sew the panels together. Let’s do mattress stitch! It’s one of my favorite things! I like to use yarn ends to sew up my seams, so I leave long tails at my cast ons and bind offs. I thread a tapestry needle, then bring the needle into the opposite piece, from the back (wrong side) to the front. Then, I do the same thing on the original piece. The needle has already gone through the opposite side, and is “stop framed” with the needle coming from the back of the work on the piece where the tail originates. To do mattress stitch on garter stitch, lay the pieces right sides up, with the edges abutting one another (see photo above). 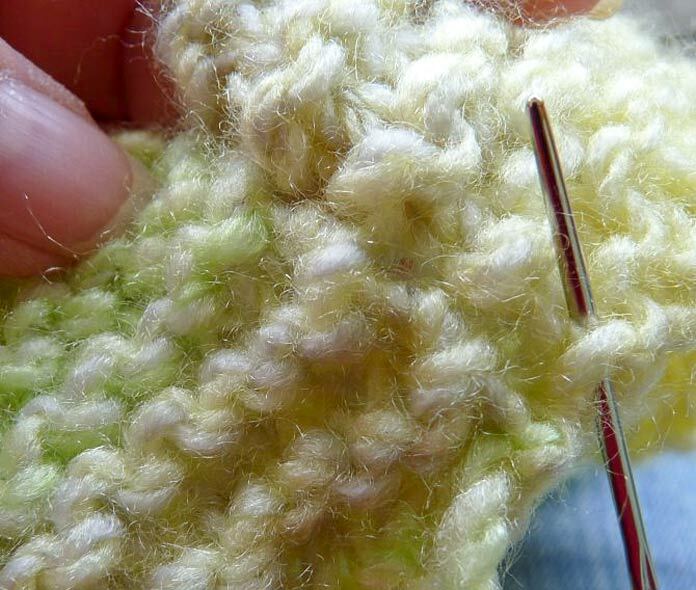 Work the tapestry needle through the bumps on the edges of each piece, alternating from side to side. 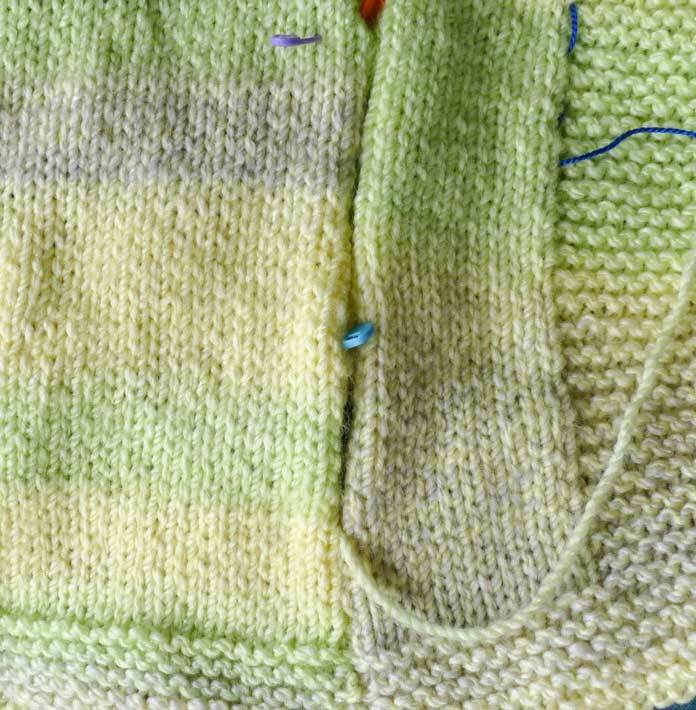 The yarn is coming out of the knitted piece on the right and the needle has been placed through the edge bump on the left piece, and also through the next bump on the right piece. Stitching through the right hand piece, the needle goes through on the left of the “V” of the stitch, between it and the edge stitch. When you’ve worked back and forth for several inches, you will end up with something that looks like shoelaces. In the photo below, I’ve left lots of thread in the seam so you can see how the work progresses. After several inches, the mattress stitch looks like lacing. Now for the magic: all I have to do is hold the base of the seam, and pull on the end of my sewing yarn to bring those two edges of fabric together. If it weren’t for the difference in the colors of the yarn between the pieces, this seam would be nearly undetectable. Often, when working stockinette stitch, one edge will be looser than the other. Earlier in this post, I suggested placing stitch markers at intervals (in this case I did every 20 rows.) Now that I’m doing the seams, I can use the stitch markers to pin the pieces together at those points and know that’s where the seams have to match. This prevents me from sewing one seam “short” of the other and it ensures that I ease the seam evenly along the entire length. Pinning the pieces together at intervals using stitch markers makes it possible to sew the seam evenly along its entire length. And that’s it! An almost instant blanket! Or is it? There is more fun to be had! 1. Sew the center panel in “upside down” so the middle of the blanket shows as reverse stockinette stitch. 2. Make the center panel 40 stitches, and make two reverse stockinette stitch stripes with 10 stitches in each. Sew them in between the center and side panels. 3. 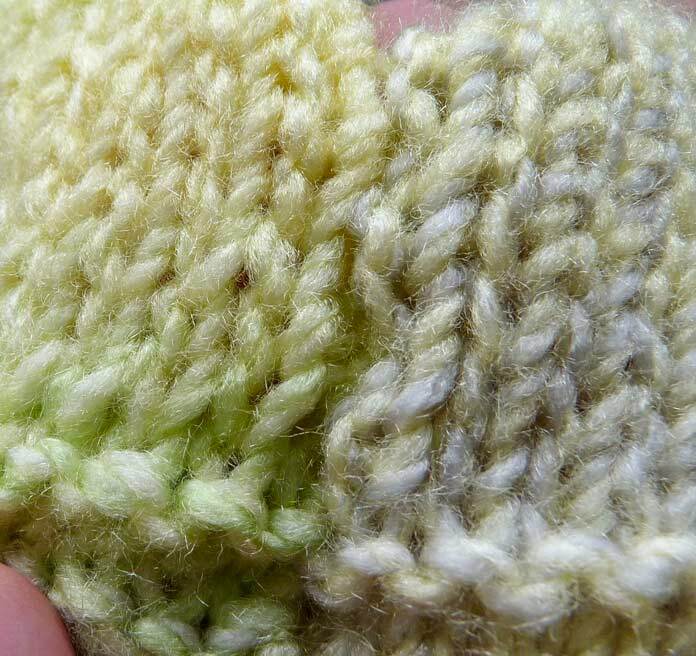 Do 2, above, and make the reverse stockinette stitch stripes with a different color of Major! With 35 colors, you can mix and match. Just like that, you’ve created your very own, custom baby blanket that will get no one in trouble for tossing it in the washer! I only had one ball of Major in the Honeydew colorway, and I was pleased that there was 40g of yarn left over. So, where my side panels each have 20 stitches, I adapted the pattern to make it a little wider, confident that there’s enough yarn to yield 16″ [40cm] length from a single ball. My “half blanket” won’t go to waste, though. I foster cats and kittens in my spare time, and my blanket will make a cozy, washable bed for one of my fur babies. 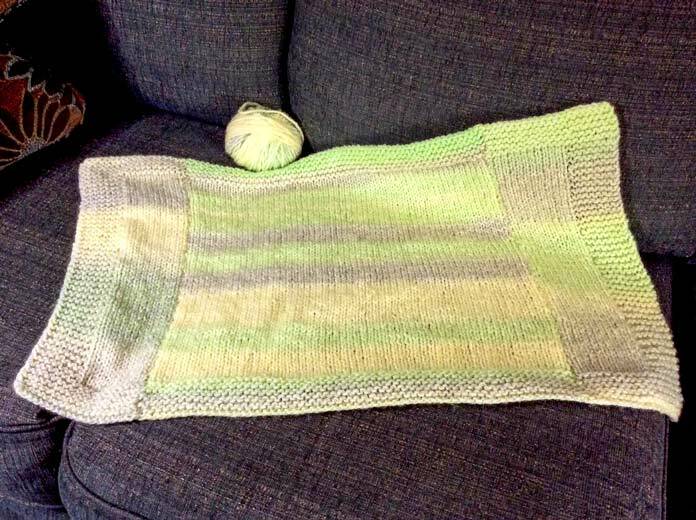 The finished size of this prototype blanket is 26″ [66cm] wide x 16″ [40cm] long. If I’d had another ball of Major, I could have made it long enough to work for a baby stroller or car seat blanket.